Pittsburgh is a community of hard-working and wildly supportive people. You’ll see us come together, wearing our black & gold, screaming with pride for our Steelers, Penguins, and yes, even our beloved Pirates! As Mister Rogers taught us, we’ll be the first to help out a neighbor. When tragedy strikes or our neighbors are in need, that’s when the Pittsburgh community stands together. At Franklin West, we embrace our Pittsburgh roots and share that commitment. With this spirit, we’re sharing the ways Pittsburghers are pulling together to have an impact on those in need. Where should you begin? Decide how you want to make a difference — whether it’s a monetary donation or lending a hand. Here are a few local options for you to get started. 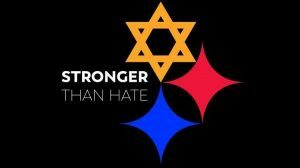 After the truly heartbreaking attack on the Tree of Life Synagogue, the community of Pittsburgh has relentlessly shown strength and support for the survivors and victims. You can still help by donating to the verified GoFundMe page. All money raised will go to the survivors and families of the victims, and it will also help with repairing damages to the building. Funds will be sent directly to the Tree of Life Congregation. 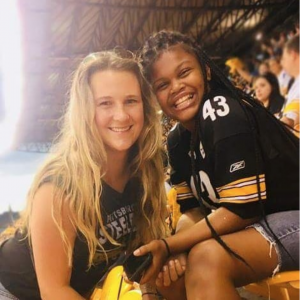 The Pittsburgh Foundation, through Pittsburgh Gives is also running a #LoveisStronger campaign to raise money toward eight organizations that were directly affected by the attack. Among those listed above, the Hebrew Immigrant Aid Society (HIAS) was specifically referenced online by the shooter. Initially started to help Jewish refugees, HIAS, one of nine national refugee resettlement organizations, helps all refugees worldwide guided by a singular mission: “Welcome the Stranger. Protect the Refugee.” HIAS stands for a world in which refugees find welcome, safety, and freedom. Guided by Jewish values and history, HIAS rescues people whose lives are in danger for being who they are. This is an organization that supports people with disabilities, and two of the victims of the shooting, brothers Cecil and David Rosenthal, received services from Achieva. In lieu of flowers, the family asked for donations to Tree of Life and/or Achieva. This non-profit is on the move to create better opportunities like friendships, integrated employment, and leadership development for those with intellectual and developmental disabilities. Their vision is to be so successful that the services become unnecessary. Read about the Best Buddies 2020 Initiative. Best Buddies offers several ways to get involved too through donation or events. Take the initiative and sign up for the Spring 2019 Best Buddies Friendship Walk! Growing up, there’s nothing more special than having someone you can look up to. Whether it means having someone to hang out with or someone to help with life’s challenges. BBBG of Greater Pittsburgh vows that all children achieve success in life through meaningful mentorship. Headquartered on Centre near S. Highland, Big Brothers. Big Sisters. is located within just a block or two of all of Franklin West’s Shadyside apartments. Have some time to spare? Walk over and see how you can help! 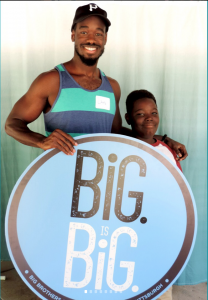 You can either make a donation or become a Big Brother or Big Sister! Dedicated to ending homelessness among veterans in the Pittsburgh region, Veteran’s Place offers homeless veterans a safe, supportive and regenerative environment as they gain the necessary skills to face real-life challenges, secure permanent housing and lead productive and self-sufficient lives. Located only a few blocks away from Franklin West, we and the Apartment Association of Metropolitan Pittsburgh have long supported Veteran’s Place. The renovations we referenced in our article last November are currently underway and the organization could really use your help! From cleaning supplies, clothing, toiletries, and food bank donations, to volunteer assistance, the options are endless. Does it make you cringe hearing that humans waste up to 40% of our food globally? That’s over 1.3 billion tons annually. If so, you have to get involved with 412 Food Rescue! 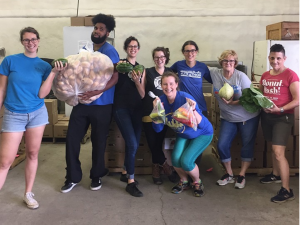 The organization’s sole mission is, “to prevent perfectly good food from entering the waste stream.” You can take action by volunteering, donating food and/or money, and so much more! Education is the power no one can take away and everyone should have the right to it. Literacy Pittsburgh sees a world with, “more inclusion and productive communities driven by access to education.” Last year, this team helped over 4,500 people reach their full potential by teaching reading, writing, math, English language, computer, and workforce skills. Literacy Pittsburgh is always welcoming new volunteers to tutor, aide, mentor, and many other opportunities. You can also help by making a donation, which you can learn more about here. This season, do more than giving thanks around a table. Spend time volunteering instead of skimming through social media. It’s a lot easier, less time consuming, and much more fulfilling than you’d think. Join the Franklin West team and the Pittsburgh community in helping the people who need it most. Because when we stand together and stand together for the long haul, real differences can happen.